The futuristic racer has received some hefty updates too. Redout was conceived at a time when playing Wipeout on a PC seemed like an impossibility (emulation aside, of course). However, thanks to PlayStation Now, it might actually happen sometime in the future. 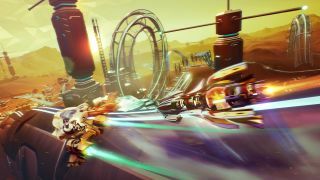 Regardless, there will always be a place for the Wipeout-inspired—not to mention Rollcage- and F-Zero-inspired—futuristic racing genre, and Redout seems to have gone down better than most. Ben Griffin wasn't overly enthusiastic when he reviewed the game last year, but it's since been embiggened with a range of DLC, including the Neptune-set, er Neptune Pack, and the more abstract V.E.R.T.E.X Pack, both of which added new tracks, liveries and more. The latest is the Mars Pack, released a couple of days ago alongside a couple of sizable updates that make an already speedy game even faster. Of the Mars Pack, developer 34BigThings says that it adds five new Mars-set tracks, a boss track, 48 additional liveries, and 20 career events, while updates 1.4.0 and 1.4.1 have improved the audio mixing, raised the level cap to 99, and fixed some areas of slowdown, among many other things.